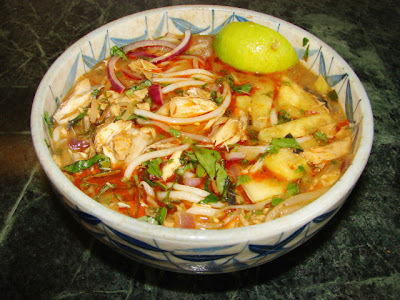 This laksa is very popular in Penang, Malaysia. It is a tangy, spicy fish noodles soup, not to be confused with the creamy coconut laksa normally called laksa lemak or Nyonya laksa. Traditional laksa does not use fish sauce or fresh coriander, but you can add some if you like. It is quite difficult to replicate the exact flavour of Penang laksa due to some of the ingredients not easily available in the west, eg. Laksa leaf/ daun kesom/ Vietnamese mint, I have not seen it before in any Chinese supermarket in England, have heard Sakkarin (BBC food board poster) bought some before. Pink torch ginger flower/ bunga kantan, I have never seen it in any oriental supermarket. Ikan kambong, a typical fish similar to mackerel but smaller is the normal fish use for this laksa. Black shrimp paste/ haeko/ petis udang – a black sticky paste not to be confused with the belachan or terasi. This is made with boiling shrimp shells and the liquor is reduced to a thick and black paste. The look and texture is very similar to marmite. 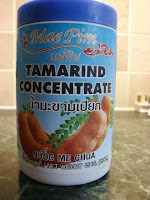 This shrimp paste is an essential ingredient for making Malaysian/ Singaporean Rojak (salad). I have seen it once or twice in Chinese supermarket, not easily available. Without the hard to find ingredient, you can still make a fabulous fragrant and spicy soup noodles with a recipe like below. My version is closest to what I know, there may be other recipes with other ingredients not found in this recipe. 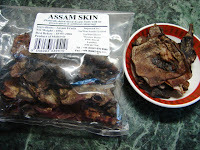 Grill the fish, skinned and boned and flaked into chunks, 1/2 to be boiled with spicy soup and 1/2 for garnish. Can save bones and heads for the stock. Blend the spice, don’t have to be very smooth. Making the soup base: Put the blended spice mix and a little oil in a large pan with water/fish stock, and the sliced ginger flower and boil for 15 -20 minutes then strain with a large metal sieve. Pour the spiced soup back into the pan. Seasoned with salt and sugar. 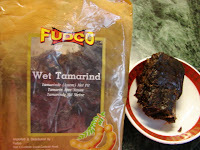 Add the tamarind juice, add half then taste, if like more keep adding. Pour soup back in the pan, add 3/4 of the fish pieces and simmer for few minutes till hot and bubbly. For the noodles, if using dried noodles, soaked then blanch in boiling water till softened. If using lai fun, make sure you soak in boiling water for at least 10 -15 minutes or till the noodles is soften, then boil till soft time depends on brand sometime takes about 20 mins. 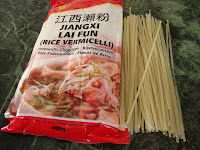 Lai fun is similar to spaghetti but a bit more chewy. If using udon just blanch for about 1 minute till hot. To assemble the dish, put enough hot noodles in deep soup noodles bowls, garnish with all the ingredients above, ladle over boiling hot soup. Serve immediately. Lime wedges on the side (squeeze juice into soup) much as you like. For the black shrimp paste you can either dollop on top of the soup or put in a Chinese soup spoon or small plate on the side, to be stirred into the soup if preferred. If you like also serve this noodles with sambal oelek or sambal belacan if you like it. Hoo Hing near Wembley had Laksa Leaves the other day, and also had Betel leaves, for Mieng Kham/ Vietnamese Bo La Lot. My impression is that they always stock them, as the betel leaves in particular looked very fresh. Lucky you, I have not seen any yet. Was in London China Town last week, been to Lung Moon (the one that stock most Thai ingredients) they got every other oriental herbs but no daun kesom. Will probably go to Wing Yip next Sunday, hope to see some.